Let’s see more of this guy on offense . . . Ronnie Bell. The freshman wide receiver is making plays when given the opportunity. 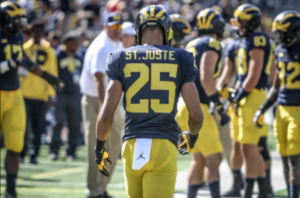 He caught a long touchdown pass from Dylan McCaffrey a couple weeks ago, and this week he caught a crossing route from Shea Patterson that turned into a catch-and-run touchdown. 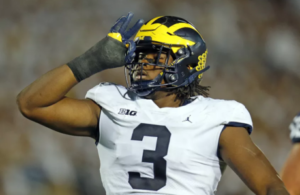 Michigan needs to keep the receivers healthy, so it’s good that Bell is getting some snaps so he (and others) can be available down the stretch. That was unexpected. Nebraska isn’t very good this season, but I still thought Michigan would struggle. 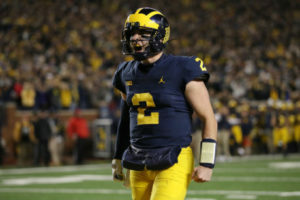 I predicted a 24-17 game in which the Wolverines would play down to the level of the Cornhuskers. I was wrong. 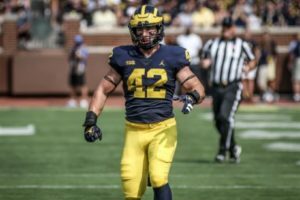 Michigan’s defense played superb football, and the offensive line was overwhelmed the whole day. It also helped that Nebraska quarterback Adrian Martinez was not up to full speed after getting hurt against Colorado; he wore a knee brace and only seemed to be operating at 75% or so. 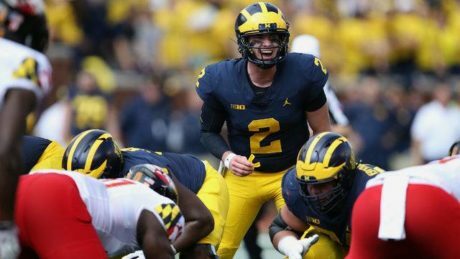 Michigan’s offense was also clicking at a higher level than they have been, and that’s a credit to them. 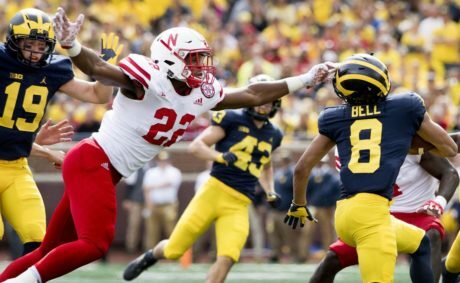 Nebraska’s defense shouldn’t have been as out of sync as the offense, but a Michigan offense that had been struggling in many ways really took it to them. Last year: Bell was a senior in high school (LINK). He caught 89 passes for 1,605 yards and 21 touchdowns. Bell was a very divisive signee back in February. He planned to play college basketball at Missouri State, and he had even signed a National Letter of Intent to play for the Bears (you didn’t know Missouri State’s mascot, did you?). 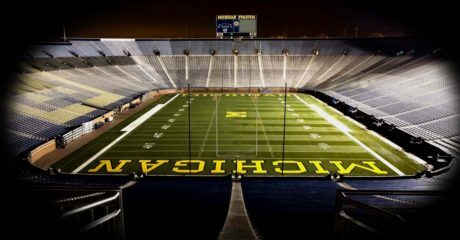 Then Michigan swooped in with an offer to play football, and that changed everything. 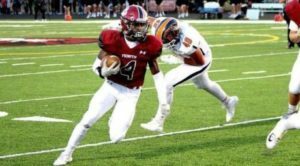 The small-college basketball player was suddenly a big-time football recruit, and it’s not hard to see why based on his eye-popping numbers (89 receptions, 1605 yards, 21 TD; 15 carries, 163 yards, 1 TD). Now Bell joins a roster that is loaded at wide receiver, at least according to the recruiting sites. 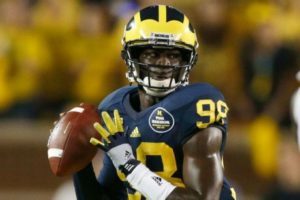 Michigan brought in four freshmen in the 2017 class, and they have some leftover star power, too (Eddie McDoom, Kekoa Crawaford, etc.). That doesn’t even include Grant Perry, who is a multi-year starter in the slot. 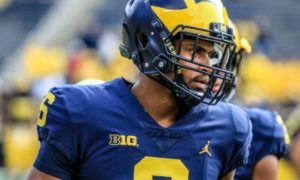 Playing time in 2018 is an uphill battle, and I think Bell will redshirt while looking to add size and strength. Hit the jump for some of Bell’s basketball highlights. 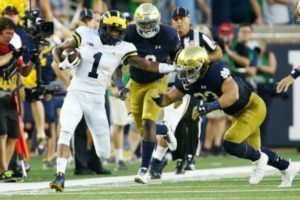 Casey Hughes – CB/S – Utah: Hughes is a 6’0″, 185 lb. 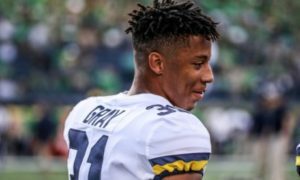 cornerback/safety who is a grad transfer from Utah, so he will be eligible to play immediately. He made 35 tackles, 2.5 tackles for loss, 1 sack, 1 pass breakup, and 2 forced fumbles as a starting cornerback in 2017. 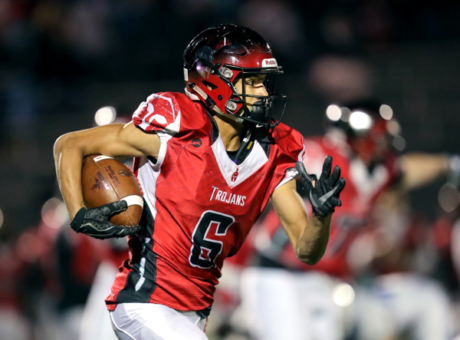 Ronnie Bell – WR – Kansas City (MO) Park Hill: Bell is committed to Michigan (LINK). This is his official visit. 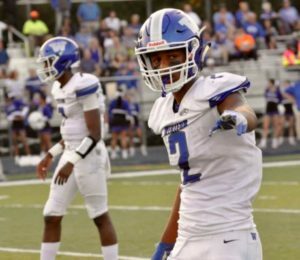 Vincent Gray – CB – Rochester (MI) Adams: Gray is a 6’2″, 180 lb. prospect who was committed to Missouri from July 2017 until recently. He’s a 3-star, the #60 cornerback, and #681 overall. 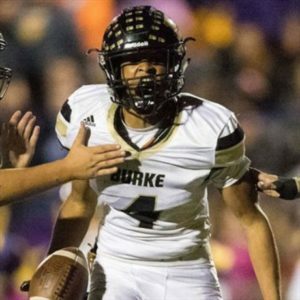 He also has offers from Iowa State, Kentucky, Michigan, West Virginia, some lower-level Power Five programs, and some MAC schools. This is his official visit. 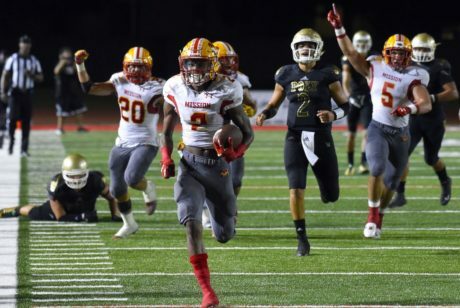 Olaijah Griffin – CB – Mission Viejo (CA) Mission Viejo: Griffin is a 6’0″, 170 lb. cornerback who was committed to UCLA until recently. He’s a 4-star, the #4 cornerback, and #31 overall, and he’s an Under Armour All-American. He has offers from Alabama, Auburn, Clemson, Michigan, Oklahoma, Oregon, Tennessee, and USC, among others. He took a visit to Tennessee and named them his leader after the visit, so that’s who Michigan is chasing right now. 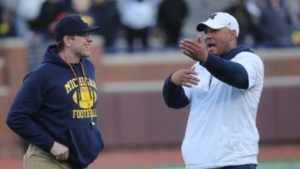 He’s a teammate of offensive tackle Jarrett Patterson, whom Michigan is also recruiting. Griffin said he would visit either Auburn or Michigan this weekend, and he will visit the other team next weekend. UPDATE: Griffin is playing in the Polynesian Bowl this weekend and will presumably not take the official visit until next weekend. 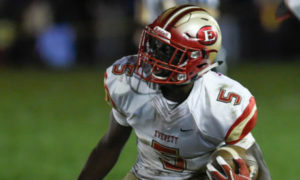 His official to Auburn is scheduled for the first weekend in February. 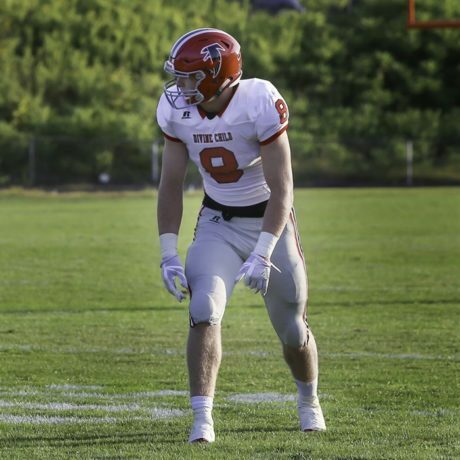 Ryan Hayes – TE/OT – Traverse City (MI) West: Hayes signed with Michigan in December (LINK). This is his official visit. Jake Moody – K – Northville (MI) Northville: Moody is a 6’1″, 180 lb. prospect with offers from Air Force, Bowling Green, Central Michigan, and UMass, among others; he also has a grayshirt offer from Michigan. 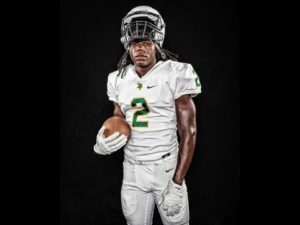 Otis Reese – LB – Leesburg (GA) Lee County: Reese is committed to Michigan (LINK) but did not sign during the early signing period. This is his official visit. Tyquavious Terrell – WR – Leesburg (GA) Lee County: Terrell is a 6’0″, 190 lb. 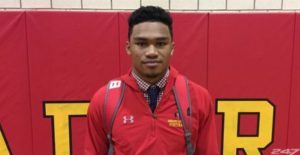 prospect with offers from Ball State, Central Michigan, Georgia Southern, Marshall, and UMass. He’s a 247 Sports 2-star, the #314 wide receiver, and #2129 overall. Terrell is a classmate of Otis Reese (see above). He claims a 4.39 forty and has very good football speed. I’m surprised he doesn’t have some bigger offers. 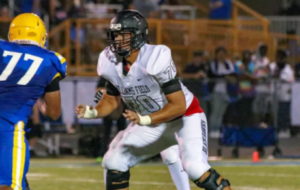 Bryan Bresee – DE – Damascus (MD) Damascus: Bresee is a 6’4″, 260 lb. 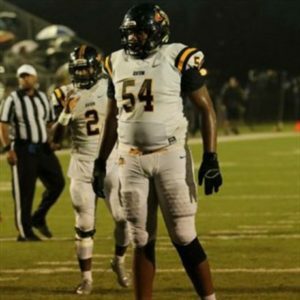 prospect with offers from Alabama, Florida State, Georgia, Michigan, and Ohio State, among others. He’s a 4-star, the #1 strongside end, and #1 overall player in the country for the 2020 class.